You know candy is colored with artificial dye. But did you know that many candies contain several kinds of dye? To see the different dyes for yourself, try this. M&M chromatography. Brown has separated into the most colors (right). Place drops of water on a flat surface, such as a plate, a cookie sheet, or tinfoil. Place candy on water and let color dissolve. Crease the coffee filter paper vertically (to help it stand up). Dab or paint a drop of candy-colored water onto the paper, an inch from the bottom. If you're testing several colors, label each with pencil. Watch the water seep up to the top edge of the paper. When water seeps up the filter paper, it separates the different colors so you can see them. M&M brown works especially well--the different dyes separate out into a rainbow. You can try this experiment with anything that contains dye, including juice, markers, or ballpoint pen (that’s why it’s better to mark your labels with pencil). I am doing this Chromatography experiment... how did it work out? Was it easy or hard? I find it very easy if I am doing it right. It works best if your spot of color is very concentrated (I like to put a dab of water on a plate and let the color dissolve, then dab that onto the paper, rather than dissolving one piece of candy in a large amount of water.) You must make sure that the bottom of the paper is in the water, but that the color spot is not submerged in the water. I have always used coffee filter paper for candy chromatography, and it works quite well. Chromatography paper would probably also work well. I tried this experiment- it worked great! Only thing I changed was using vinegar (the white kind) to separate the dyes instead of water- I got more color separation. You might remind folks that the colors won't be intense. If they use food dye.. directly ... yes. Ours was hard to see, but it was fun! 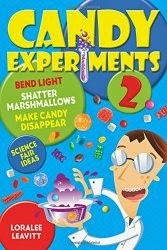 AND if you use juice (some dumb mom bought fruit juice jelly beans) you won't get dyes... read the back. Arggh! Still - a lesson on eating healthier!